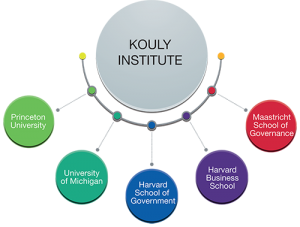 Kouly Institute is a Think Tank of research and capacity building that grew out of the scholarly work of its founders at Harvard and Princeton universities with the purpose of re-thinking leadership and strategy from a global and inclusive perspective. 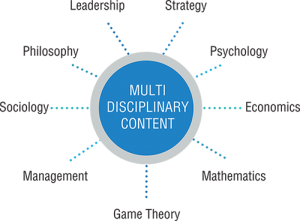 The approach that Kouly Institute takes is inspired by the way leadership is defined and taught by some of world’sgreatest thought leaders at Harvard. Michael Kouly, who studied and taught at Harvard and Princeton, added more than 30 years of international corporate experience in practicing and researching leadership in a global and multicultural context. The style that Kouly Institute adopts in designing and delivering its programs is alsounique in the way it blends experiential learning, simulations, theory, coaching and practice to deliver the profoundness of what leadership really means. People with a clear sense of purpose experience success in a more fulfilling way. Organizations with a clearpurpose, a leadership culture and an intelligent adaptive strategy exponentially outperform the rest. That isthe power of purposeful leadership.